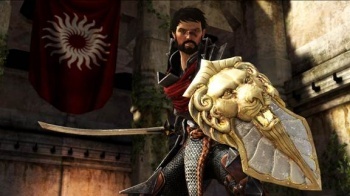 Feedback from players caused BioWare to reconsider how it handled DLC for Dragon Age 2. The downloadable content for the first Dragon Age put us in the shoes of an apostate witch who lived in a forest, a travelling bard, and a novice Grey Warden, although not the same one as in the main game. For the sequel, however, the focus will remain squarely on the main character Hawke. Dragon Age 2's lead designer, Mike Laidlaw, said that BioWare had plans to support the sequel with new content in the same way it had done with the first game. What BioWare wasn't going to do, however, was change the character that people played between different pieces of content. Laidlaw said that one of the most common bits of feedback that BioWare had received from players was that they wanted to play and progress the same character throughout their entire experience. He added that it was a request that BioWare had been happy to fulfill. It's not hard to see why people might want to stay as the same character; after spending dozens of hours building Hawke's history and personality, you get more than a little attached. Hopefully though, we'll still get the chance to learn more about the world and characters of Dragon Age. BioWare always puts an amazing of effort into the backstory for their games, though, and there's potentially hours of enjoyment to be had exploring the world it made. Dragon Age 2 comes out for Xbox 360, PS3, and PC on March 8th in North America, and on March 11th in Europe.